Fall is a time of vivid colors and aromas. No other season in the year has so many tastes and smells associated exclusively with it. With Fall you have pumpkins and apples galore, and more sweets and treats than you can eat! One of the best parts of baking in the Fall is finding new ways to make old recipes, or to try something entirely new! That’s why we’ve compiled a short list of some amazing muffin recipes you have got to try! For the perfect blend of sweet and crunchy, look no further. 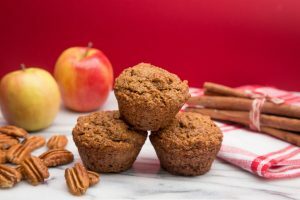 These delicious muffins have a wonderful mix of apples and Autumn spices to captivate your taste buds. With crunchy brown sugar to top it all off, what’s not to love? The best part is this recipe uses whole flour, so you’ll get a unique taste from the finished product. Check out the recipe here. There’s no more iconic flavor combination than pumpkin and Fall. Add some pecans on top and you have a recipe for deliciousness. These pumpkin pecan muffins are designed to taste like pumpkin bread but in muffin form! The additional pecans on top combined with the sugar make for a sweet treat for anyone. If you’re a fan of pumpkin, you definitely need to try this recipe out! Check out the recipe here. Whether you like peanut butter, chocolate chip, or oatmeal, there’s something here for everyone to love. These muffins are bursting with flavor, and are surprisingly simple to make. If you’re not a fan of the flavor combination, feel free to change the ingredients around to suit your tastes! Feel free to substitute your own ingredients to achieve the flavor combination that most appeals to you! Check out the recipe here. We had a pumpkin pecan muffin earlier, but let’s try something more simplistic: pure pumpkin. Pumpkin is the flavor most associated with Fall. These muffins want to assault your taste buds with that pure Fall feeling that pumpkin brings. They’re not too complicated, and there’s not any extra garnish, but these little muffins are the perfect treat for this Fall season. Check out the recipe here. While they may not be pumpkin flavored, these muffins still taste delicious. Blueberry has always been a favorite muffin flavor, but adding gingerbread into the mix just makes them even better. The streusel topping is just the icing on the cake or the crust on the muffin. It adds a little extra punch to the flavor, and we love it. Check out the recipe here. For our last recipe, we wanted to go with the nut theme again. Baked fruits and nuts have always been a hallmark of Fall, and this recipe is no different. The baked pears go wonderfully with the crunchiness of the walnuts, and the ginger flavor throughout really brings it all together. We loved how easy these muffins were to make, despite the many ingredients. Just like the other recipes, if you want to substitute different ingredients, say nuts or fruits, go for it! Make it your own. Check out the recipe here. While there are a million muffin recipes out there, these were some of our favorite Fall themed ones. Each one provides a unique flavor experience like no other, and they’re great snacks! They can be frozen or shared at events relatively easily, and they’re simple enough that even the busiest of people can spare a few minutes to bake up something delicious. This entry was posted in Caregivers, Tips and tagged muffins, pumpkin spice, recipes. Bookmark the permalink. Comments are closed, but you can leave a trackback: Trackback URL.